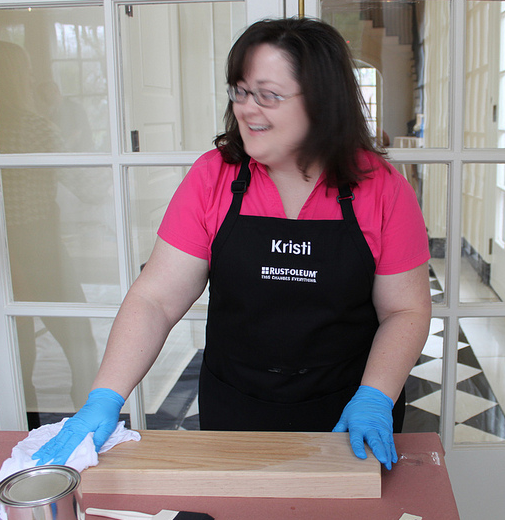 Last week, I had the privilege of attending the Rust-Oleum Blogger Event in Charlotte, North Carolina. It was a whirlwind two-day event, and I finally got to meet many of my favorite bloggers who I had only known online until then. Back row: Kate, Rhoda, Roeshel, Sarah, Beth, Ashley, Traci, Ethan, and me. Front row: Cassity, Whitney, and Jocie. 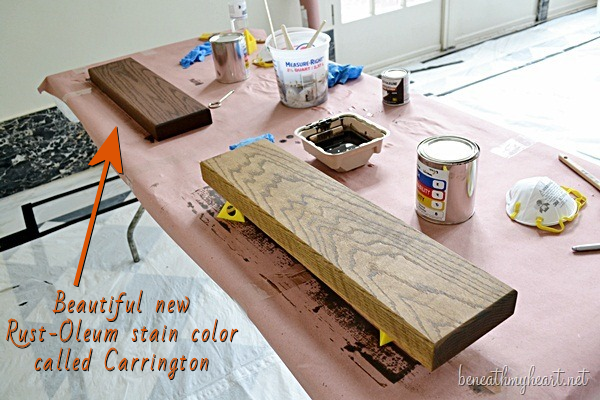 And I got to try out a new stain color that isn’t in the stores yet. It’s a beautiful darkish medium “true” brown color with just the tiniest hint of red, and it’s called Carrington. So keep an eye out for that. It’s my new favorite, for sure! I swiped the picture above and below from Traci at Beneath My Heart. And here’s me with one of my new favorite people in the world. So it was a fantastic time, and I love Rust-Oleum even more now that ever. They didn’t even have to fly me out to North Carolina and treat me to an amazing dinner for me to say that. I’ve always loved their products, and if you take a look through the projects on my blog, you’ll see Rust-Oleum products popping up in almost every one of them that required spray priming and painting. They’ve been my brand of choice because their products are amazing. Whether I’m doing a fun craft project, or tackling something tougher like painting bathroom faucets and a shower enclosure, I know I can count on Rust-Oleum. But what makes me like them even more (if that’s even possible) is that Rust-Oleum knows and understands the value of bloggers. Most companies today could definitely learn some lessons from Rust-Oleum in this area. We bloggers have a strong and powerful voice. We’re a force to be reckoned with. Rust-Oleum gets it. And for that, I appreciate them and am so very thankful to them. For those of you who are new around here, let me explain. My husband, Matt, has M.S. and has been in a wheelchair for about three years now. While he’s fairly independent, he still needs my help regularly throughout the day with various things. There’s no way I can just pack up and go on a trip and leave him here by himself. He simply must have someone here who can help him with certain things. So I was ready to say, “Thanks for the invite, but I can’t make it,” when my mom told me about an agency here in Waco that will send someone to your house to stay with people who need assistance like Matt does. We checked into the company, and it sounded fantastic. They sent a woman out to our home to meet us, fill out all of the paperwork, and to make notes of the specific help that Matt would need while I was gone. Everything was set. They would arrange for a male caregiver to stay in our home, and I felt very peaceful about leaving. Until he showed up on the night I was supposed to leave. Now let me say that the man they sent was very nice. I could tell right off that he and Matt would get along just fine. Well, somewhere along the way, someone at that agency failed to communicate the fact that we have a big 70-pound dog named Boo who would need to be taken out at least three times a day, and would need to be fed while I was gone. And the man they sent was deathly afraid of big dogs. I was supposed to be in the car heading to Dallas by 7:15pm. But here I was at 7:15, learning that the man who they sent was so afraid of dogs that he wasn’t going to be able to take Boo out or feed him. I tried to convince him that Boo was just a harmless teddy bear who had never so much as bitten a human before, but he was unconvinced. His fear simply wouldn’t let him see Boo for the harmless pup that he is. So I, already feeling a bit anxious and stressed about leaving Matt for the first time since he’s been in a wheelchair, and feeling anxious and nervous about traveling for the first time in years, completely went to pieces. I planted my bum on my banquette, made a frantic call to the agency that sent this man to our house, and made a tearful plea that they fix the situation immediately becuase I was supposed to be on the road. They tried to find someone else to come to the house, but the only available caregivers who could get there on such short notice were all females. I had planned well in advance specifically so that we could have a male caregiver here with Matt, and I knew Matt wouldn’t be comfortable with a woman staying here with him. So finally, I had to make last minute arrangements for Boo to stay at my parents’ house, which meant that I had to gather his stuff, drive him across town, and make sure he was settled before I could leave. I was finally able to leave Waco at about 8:35 to head to Dallas…feeling stressed, anxious, exhausted, nervous, sad, and so many other negative emotions. And all of those emotions surfaced once I was in the car alone, driving to Dallas. I cried about half the way there. So I thought that was the end of it. Once Boo was settled, I thought that I could then relax, confident that Boo and Matt were now taken care of. When I finally got to my brother’s house in Dallas, I called Matt to tell him that I had made it okay. That’s when he told me that the man who was staying with him needed to leave in the morning at 10:00, and would be gone for about an hour. Okay, without going into too much detail, let me just explain that if Matt is going to need any assistance at all, it’s going to be in the morning. Once his morning…ummm…business…is taken care of, and he’s safely back in his wheelchair, he can be on his own without any problem at all. But until that’s taken care of, he needs someone here with him to help him transfer to and from the wheelchair just in case he doesn’t have the leg strength to do it on his own!!! So once again, I was furious…and anxious…and frightened. And there were more tears. I could just imagine this man leaving for “just one hour”, and coming back to find that Matt had fallen on the floor in the bathroom because he tried to transfer himself but didn’t have the leg strength to do so. I went to bed at midnight, and tried my hardest to sleep, but just couldn’t. I finally drifted off at about 2:00am, but woke up at 4:00am, still anxious and worried. Finally, at 5:45am, I called the agency and spoke to the on-call person. I obviously woke her up out of a deep sleep, but honestly, I didn’t care. I explained the situation, and told her that the reason I hired them in the first place was so that I could have peace of mind, and ever since they stepped foot in my home, I had had the very opposite of “peace of mind”. She apologized profusely, and assured me that they would get a male to stay with Matt during that hour. And it’s a good thing they did, because that’s precisely when Matt needed assistance. So after all of that, I was determined that I would never travel again. In fact, I had determined that as soon as I arrived at the airport on Wednesday morning, I would get online and sell my ticket to the Haven Conference in August. There was simply no way I was going to deal with that stress again. But I didn’t sell my ticket. I’m still going to Haven. And after meeting all of the bloggers at the Rust-Oleum Blogger Event, I’m even more excited about Haven and having the opportunity to meet even more bloggers. But next time, I’ll know exactly what questions to ask, and exactly what requirements need to be communicated to this agency. I’m willing to try it one more time. Next Post Why Can't We All Just Be Nice? So glad that it worked out but I can imagine the anxiety in leaving him in the care of someone else. See you at Haven! 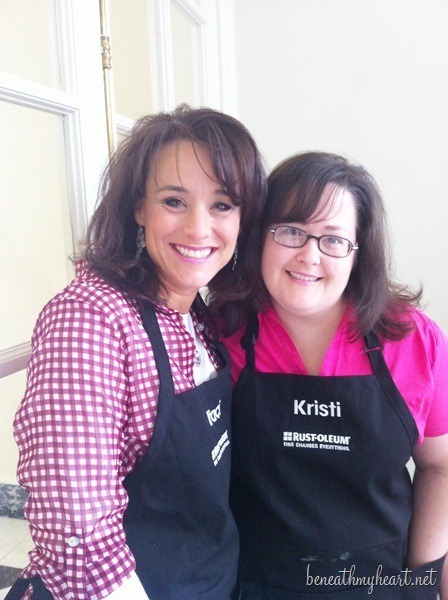 Oh Kristi, thank you for sharing such a personal story. I am grateful that you got to go, but am so sorry about the stress you felt. I am so glad you plan on attending Haven still and I will feel even more grateful getting to meet you and spend some time with you after reading this post today! On a lighter note, what a fun time it sounds like you had with a great group of gals! Oh, Kristi, I had no idea you had dealt with all of that turmoil before you got to Charlotte. So glad you made it and we got to meet up. I’d love to sit and chat with you more one day about blogging and all of that. Time went so fast. Glad you got to hang with Traci, she is a nut, isn’t she? One of my fave people too, she makes everyone happy. I’m so so glad you are still coming to Haven. Yes, plan in advance so you can have a great time and not worry. So nice to finally meet you in person too! I am glad you were able to make this trip … sounds like it was a fantastic event and sounds like it was completely invigorating. + like hearing all about Rustoleum’s new offerings. cheers! I’m so glad you were able to work it all out and still enjoy your trip. It sounds like it was just the inspiration you needed! I wish I was going to Haven!! Have a great time! Wow, sounds like a super stressed and awesome trip at the same time. I really hope everything works out for Haven and that you get to go. And I hear you on the dogs that are just teddy bears, but people freak. Our little 45lb Aussie had one delivery guy running back to his truck and we hadn’t even opened the storm door! 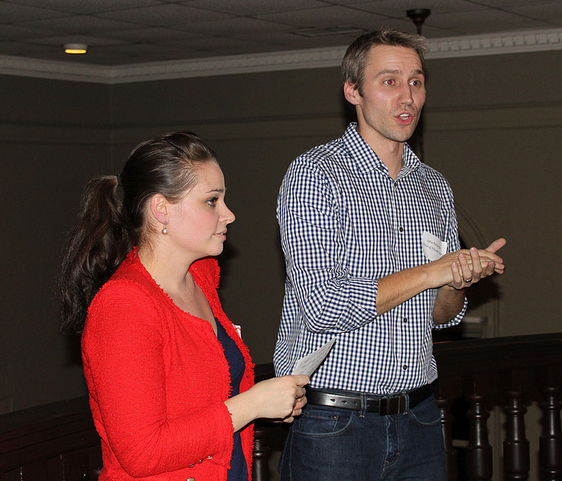 I was so excited when I saw you in all the photos that were popping up on the blogs of the Rustoleum event attendees. I did not know your husband had MS. I am so happy that you got him the care he needed and it all worked out in the end and you got to go to the event. As stressful as it was – a little get-away is always needed once in a while when you are the main caregiver for someone. Bless you XO I look forward to meeting you at Haven. 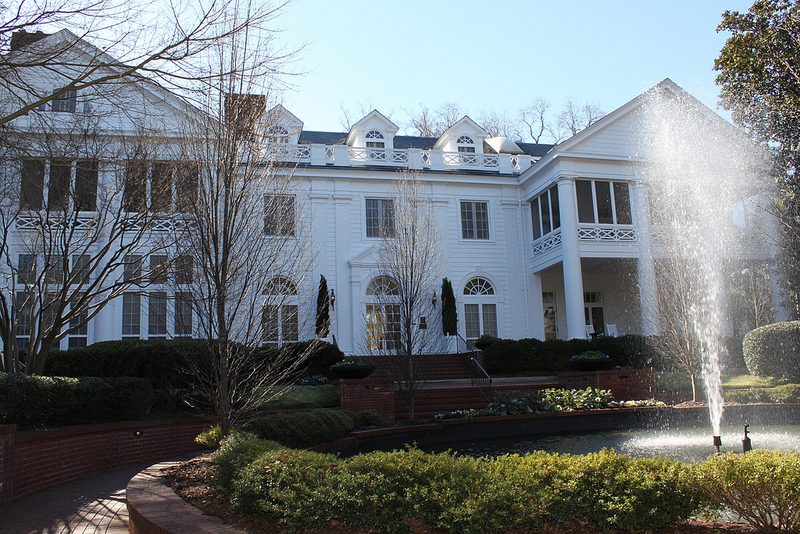 The Duke Mansion looks gorgeous!! Perhaps one day I’ll get to meet all you design bloggers too! And…all things happen for a reason. So, you were supposed to be there even though you had to jump through some “hoop” to get there. You’re a dedicated and loving wife indeed! Kristi, Glad to hear about your journey and how it worked out. So stressful! I’m going to Haven as my first blogger conference and would love to meet you too. It sounds like it was a wonderful event! I’m glad you were able to make it. I’m glad to hear you are still planning on going to Haven. I’m looking forward to meeting you. I’m so glad you got to go! I just wanted to say that you and I have bonded whether or not you know it, LOL. I am a widow. I lost my husband 2 years ago. I look around my house and see SO much that needs to be done. I certainly do not have the money to hire it done and I have been concerned with whether or not I, alone, could handle it. I’ve read back through at least a year of postings. I have convinced myself if you can do it alone, so can I. I can tackle it one project at a time and stay busy for years to come. Thank you for the inspiration and for the confidence you’ve inspired in me. You go, girl! Aw girl, I had no idea that is the reason you couldn’t sleep while in Dallas :(. I’m so sorry you had all that on your plate while in Charlotte. I actually wanted to ask you who was taking care of Matt while you were away but didn’t want to pry. It was SUCH a joy to meet you and finally give you a big hug! I’m glad you didn’t sell your Haven ticket because we need you there!! XOXO! I’m sorry setting up your trip was so stressful but am glad it all worked out. 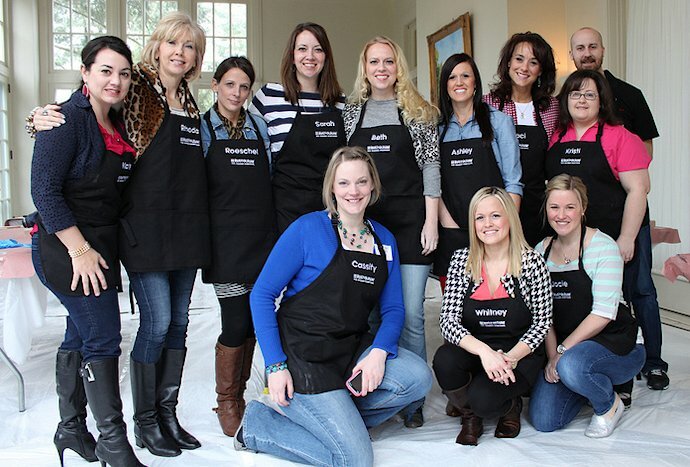 The Duke Mansion looks gorgeous and I’m sure you had fun with all the other bloggers, trying out new products and laughing! Who wouldn’t love that? I completely understand your anxiety. I lived through a similar situation for many years and it isn’t easy. I’m glad that you did get to enjoy your trip in the end! Love you, girl! So glad we are now friends IRL. I must say you are quite a woman! Thank you for sharing your story and inspiring the rest of us to be true DIY women even under challenging circumstances. Sounds like you don’t believe in obstacles but you choose to believe in opportunities. Oh, Kristi, what a nerve-wracking, stressful beginning to your trip! I’m so glad it all worked out for you and Matt- and Boo. Glad you’re still planning to come to Haven. I sure hope I get to meet you in person- you have been such a blessing. I am so touched to read your story. Thank you for sharing. I am so glad that you got to go to the conference, and I take it everything turned out OK for your husband. I have a student I work with at school who’s mother battled MS for years, and I have witnessed their struggle. I am saying a prayer for you both tonight that God will pour down his blessings on you both. Reading this could NOT have come at a Better – Or WORSE – time for me!! I am traveling TODAY – in fact i am sitting here at my computer – with my hands shaking and procrastinating the last 10 things on my list because I have so much anxiety over traveling. Ack! I don’t get to cry in the car – my family will all be with me. And really, it’s important to me that they (the kids) NOT know how wound up I am. I really hope to meet you at Haven – we can commiserate about travel stories. So glad that you got to go and I will be praying that your future travels will go more smoothly! Oh my goodness, I am just crying right now. Not because I am sad for you, but because I am so inspired by your courage and determination. My Dad is in a wheelchair full time and has to be transferred with a lift. We moved to this little town we live in so that we could assist my Mom with caregiving. In addition, one of my children has special needs (not physical), so neither my husband or I can be out of town, because one of us always has to be with our kids, and one of us has to be available to help my Dad if he has trouble (my Mom is not strong enough to do some of the things for his care). So to hear about your success in being able to go to your conference and still planning to go to Haven just brought tears to my eyes. Bless you. First of all – that mansion is amazing!! You lucky gal – so glad you went! And so glad you aren’t canceling your Haven trip. Can’t wait to meet you in person – because there’s nothing I like better than laughing until I can’t breathe (my girls call it my old man laugh)! Glad it all worked out for Matt (& Boo)! Hi! I have had your blog bookmarked for quite awhile now but for some reason had not really read it until recently. I am amazed at your talent and skill and love your very well done blog. I was almost in tears reading this post as I was empathizing with the turmoil you endured. Praise God that it all worked out in the end–I am so glad for that. Looking forward to more of your awesome projects!